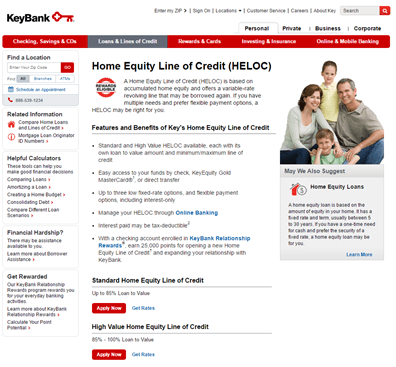 Key Bank has more flexibility on the terms for its home equity loans and lines of credit. The tradeoff for this enhanced flexibility, however, is more fees. Key Bank lets you use your second home as collateral for your home equity loan. There’s no way to avoid paying closing fees. 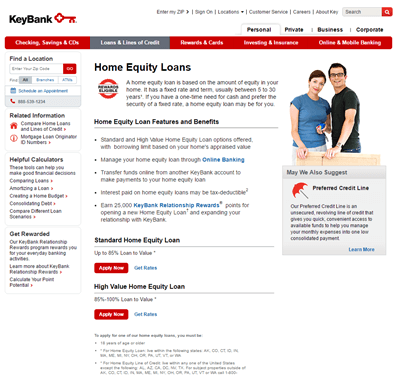 Key Bank is a lender offering home equity loans and home equity lines of credit. They have more flexible terms than most of the lenders that we reviewed, including the benefit of using your second home as collateral for your loan. You will have to pay closing fees, which is something that most of the lenders we review waive or cover themselves. The interest rates charged by Key Bank tended to be more flexible than those offered by the other lenders we reviewed. However, Key Bank is notorious for charging fees that other lenders are willing to waive or cover in order to make the transaction. In particular, Key Bank will almost always charge greater closing costs than other banks, and has been known to have a number of different application fees as well. On the whole, the fees that Key Bank charged were slightly higher than other lenders we reviewed. One of the best things about Key Bank is the high flexibility in the range of products they offer. Therefore they have a number of products that will be appealing to individuals in different situations, including high equity, low equity, and different credit scores. However, in order to provide the financial support for this flexibility, Key Bank tends to have a higher number of fees, and more expensive fees, than other lenders that we reviewed. Another advantage of using Key Bank to obtain a home equity loan or home equity line of credit is the wide range of loan requirements they offer. These products include different loan to value ratio offerings. However, you should be aware that if your credit score isn’t very good then you can expect that you’ll be paying a higher interest rate than you might with other lenders. Furthermore, Key Bank lets you use a second home or rental property as collateral against your home equity loan, which can help keep your rates low. It can be hard to get information on how long it takes before you can access your loan, and how long the loan process takes, but the best information available suggests that it can take as few as three weeks or as many as eight. The customer experience for Key Bank was inconsistent. It is better in person than it was on the phone or online, but it is hard to tell if this is always the case. Some customers were put off after finding out the sample loans on the website were examples of potential loans and not actual products on offer. Moreover, because home equity loans are regulated differently in different states, some customers had trouble finding information about loans that they could get where they live. However, with over 1,000 branches in 13 states, it should be easy to locate a branch if Key Bank operates within your bank. Key Bank enjoys a number of advantages in terms of flexibility of its products and the ability to use a second home as collateral, however their higher than average fees keep them out of the very top of our home equity loan and home equity line of credit providers. However, if they operate in a state you live in then they are still a good place to investigate.